One of the big trends at the International Consumer Electronics Show (CES) this year, is digital health. Moments ago, Kolibree, took the veil off its connected electric toothbrush — a world first the French company says. Kolibree’s war on periodontal disease involves a BlueTooth-connected smart toothbrush and a free mobile app that analyses your brushing habits. The one-two-punch will monitor your brushing sessions, and make recommendations for boosting your dental care. The data about how you brush automatically syncs with your smartphone and scores your efforts based on things like: how long you’ve brushed and whether or not you’ve accessed the “hard-to-reach but important parts of your teeth and gums.” Kolibree allows you to share your brushing stats with your dentist and family, if you choose. The dental care industry has tried many, many tricks to make brushing more appealing for kids, but Kolibree might actually be the industry’s best bet yet. Designed for families, the app works with several toothbrushes so the entire family can participate. Kolibree rewards progress and cheers you on when you are improving, allocating points to kids to encourage them to improve their brushing habits. While Kolibree doesn’t claim to solve periodontal disease or suggest it can keep cavities or gingivitis at bay, it is a welcome tool for establishing a baseline on which to improve your brushing habits. It may also, once and for all, give parents piece of mind that their kids are in fact looking after their pearly whites. The team behind Kolibree says that the brushing data will be available via an API to let third-party game designers develop new apps and enhance brushing time. Judging by the many existing apps out there aimed at making brush time more fun for kids — some backed by major brands such as GlaxoSmithKline’s Aquafresh and Macleans — Kolibree’s API is a good idea. 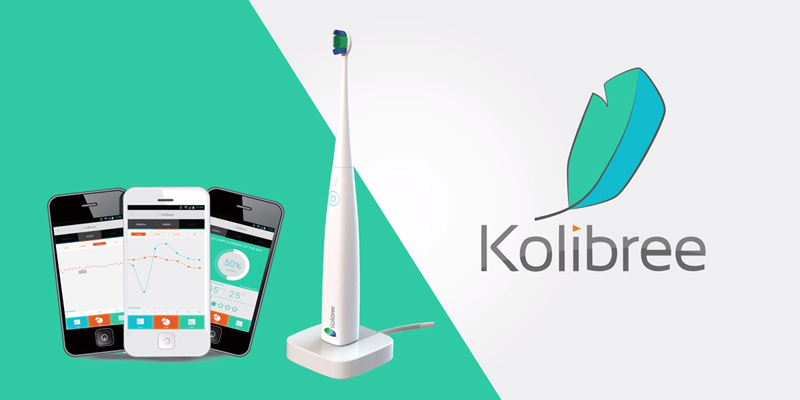 The Kolibree connected toothbrush will be available starting in the third quarter of 2014 but pre-orders start earlier this year. Orders will be available initially through Kickstarter and can be shipped worldwide. The price of Kolibree will range from US$99 to US$200 depending on the model and will include the free mobile app. In 2012, Beam unveiled its connected toothbrush, the Beam Brush which currently retails for around US$25. Compared to Kolibree’s effort, the Beam Brush simply tracks brushing duration through a sensor that knows when it’s actually being used to scrub your teeth. Unlike Kolibree it does not keep track of what areas of your mouth have been brushed, nor does it include scoring or reward systems. While we’re on the topic of digital health, it’s worth mentioning Hapifork. Released in the middle of last year, the connected fork aims to help you healthier, slower, and less by buzzing if you’re scarfing your food too fast. From eating to brushing, are we finally seeing the beginnings of the internet of things?